Determine location of overhead and underground utility lines. Remember, trees are more than just what you see overhead. Often, the root area becomes larger than the branch spread above ground. Since many different types of utility services are now buried, please call South Dakota One Call before you begin to dig. The location of these facilities should directly correlate to your choices of tree type and site selection. Do not assume that utility lines and facilities are buried deeper than you plan to dig. In some cases, underground facilities are very close to the surface. Determine type of tree. Consider its height at full maturity and the root area it will require. 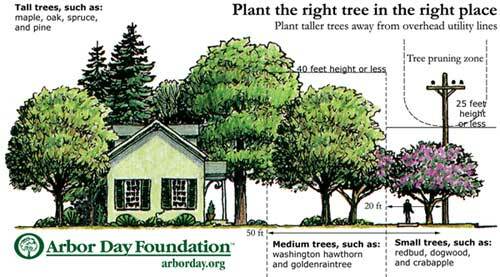 Remember, trees grow in width as well as height. Trees that will reach 25 to 50 feet high at maturity should not be planted within 30 feet of overhead electric lines. Trees that will reach 50 feet or more at maturity should not be planted within 50 feet of overhead electric lines. Children or adults climbing in trees can receive severe or fatal injuries if they come in contact with the overhead wires. Low-growing trees that will not grow taller than 20 feet may be planted closer to overhead power lines. However, Moreau-Grand Electric Cooperative asks that you do not plant trees or shrubs in close proximity to our poles or any pad mount transformer or junction box, as the tree will limit access to equipment by our crews. Please maintain a buffer zone of about 15 feet from all utility lines and equipment. Consult your local nursery or the County Extension office for information to help you select trees that will be appropriate for your property. Occasionally, large and established trees may require trimming, or removal, to avoid hazardous conditions or service interruption problems. We appreciate your cooperation in allowing us to continue to provide safe, efficient and reliable service to you and your neighbors.